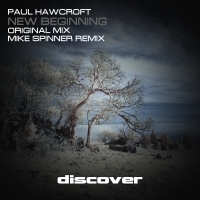 At Discover we love it when a track proves that uplifting trance does not have to be written at break neck speed to compete on the dancefloor and with New Beginning, Paul Hawcroft proves exactly that. The melodies and production quality oozes class from the start as the track moves through the gears in style. Discover favourite Mike Spinner is on remix duties for this one and he cranks up the BPM's perfectly as well as delivering his own lush interpretation of an already beautiful track.